The alluvial flood plains of north Bihar are considered to be safe from a groundwater perspective given the abundance of water, both surface water and groundwater. These aquifers, however, are showing the presence of various contaminants including arsenic, iron, and microbial pathogens. Drinking water problems are compounded by regular floods and absence of or poor sanitation facilities. 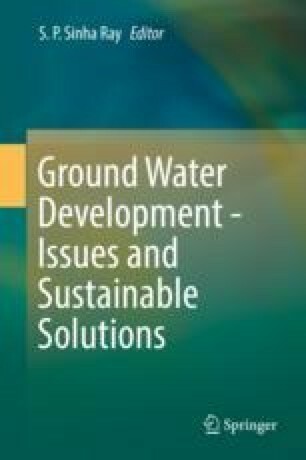 Given the shared nature of regional alluvial aquifers, the interventions in such settings should consider groundwater as a common pool resource requiring a participatory approach for developing contextual solutions. The participatory groundwater management (PGWM) program in north Bihar has shown that there is considerable variability at local scales in alluvial aquifers, thus requiring a sound understanding of local hydrogeology for proposing solutions. The PGWM program in north Bihar is focused on drinking water security in the alluvial flood plains, and as a part of the program, arsenic is one of the major issues being researched. Arsenic is a major health concern when it occurs in drinking water and has been reported from the regions near the Ganga and Kosi rivers in north Bihar. Ongoing action research in five districts has shown the presence of arsenic in districts that have not been reported to have shown the presence of arsenic contamination. This paper discusses certain trends in arsenic contamination in the selected locations.